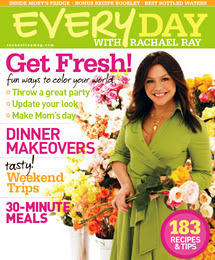 The May issue of Every Day with Rachael Ray has hit newsstands and it looks like a keeper. This issue contains a whole bunch of grill-themed and spring-y 30-Minute Meals including Fluffy Florentine Frittata, Pressed Manchego Cheese Sammies and Spicy Spanish Salad, Grilled Eggplant and Capicola Stacks, Grilled Ratatouille with Ricotta and Charred Bread, Figure-Friendly Soba Dipping Noodles, Grilled Surf and Turf, Grilled Tuna Steaks with Potato and Green Bean Salad, and Sea Bass Puttanesca in a Foil Pouch. In a feature called The Good Egg, this issues shares recipes for Poached Eggs with Mushroom Home Fries, Egg, Goat Cheese and Tomato Toasts, Bacon and Egg Caesar, Alsace and Lorraine Omelet and Mango Soufflé with Coconut Whipped Cream. In the No-Recipe Zone, you can learn how to make a veggie-cheese tart. In the ever popular Burger of the Month feature, you'll find Sloppy Joe's Spanish cousin: Sloppy Joaquin. In Hand Me Down, the magazine recreates a reader's favorite chocolate chip cake and you can also learn how to make marshmallow-coated coconut cake. The "Get Togethers" the magazine shows how to throw a mother-daughter scrap booking party so you can preserve all your favorite recipes. Maybe some of these will make the cut after you try them out at the party: Great Grandma's Baked Chicken, Wild Rice with Pine Nuts, Asparagus Salad, Chilled Raspberry Cream Pie, and Pomegranate Coolers. If scrap booking isn't your thing, how about a Kentucky Derby party? This one using the Express Lane concept (meaning if you have the required stuff on hand, you'll only have to pick up a few things at the store): Bourbon Old Fashioned, Country Ham Biscuits, Benedictine Salad, Grits Cakes with Pimiento Cheese, and Mint Julep Melon Bites. You can also get recipes for turning a weeknight meal into a Cinco de Mayo fiesta and learn why screw cap wine can be just as good as the corked stuff. Also, the mag provides a few unique gifts to give away as favors at your parties. The travel feature takes us to a location near me for once - San Francisco. Choose from five different days in the City (that's what we call it - definitely not San Fran). If San Francisco isn't your thing, try out the Jazz Fest in New Orleans. Or head to the opposite coast and take a preppy trip to Newport, Rhode Island. Ooooh, Cinco de Mayo party here I come!